This full-court transition drill teaches and re-inforces our secondary "numbered" break offense. There are five options, so each team of five makes five trips up and down the court executing each of the five options. We stress speed, quickness, sprinting up the court, and getting the ball inbounded quickly by O3. 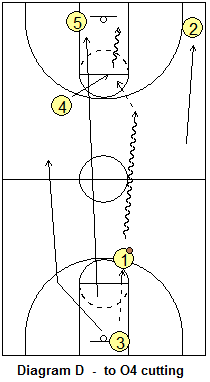 We want O2, O3 and O4 running wide, along the sidelines, and then getting to their spots once across half-court. 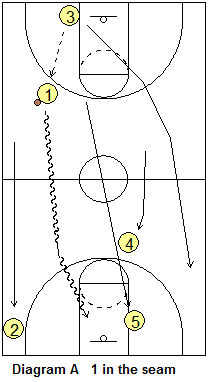 O5 makes a straight "bee-line" sprint to the opposite low block. O1 attacks a little to the right of center, as this creates a better angle for attacking the "seam" with a dribble-move. See the diagrams below. 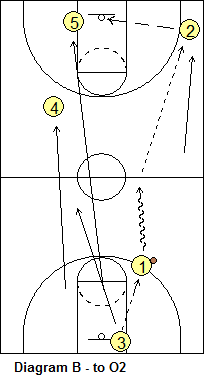 In all of these options, O3 is the inbounder, O1 gets the inbounds pass and speed-dribbles up the floor, O2 sprints wide to the right corner at the 3-point arc, O5 sprints to the basket, O4 sprints to just left of the top-of the key at the 3-point arc, and O3 is the trailer and eventually ends up in the usual 3-spot on the left wing. We go through each of our five options. dribble move and takes the right seam for the lay-up. O3 gets the ball out of the net, passes inbounds to O1 and all five then sprint back up the floor in the opposite direction and this time we do option 2, which is the pass up to O2 in the corner. O2 shoots the shot. We rebound a miss, put it in the hoop and then O3 gets it and inbounds it to O1 for the third trip up the court. Now O1 goes to option 3, O4 will make the "4-cut" across the lane to the block opposite O5. O3 trails the play, fills in to the usual 3-spot, receives the pass from O1 and takes the shot. Again, we rebound a miss and put the ball in the hoop. O3 inbounds the ball to O1, and it's back up the court. The next trip is option 4. Here, O4 initially hesitates at the top of the key and, in a game situation, must read what O1 does. If O1 takes the ball to the hoop, O4 must trail O1 for the rebound. 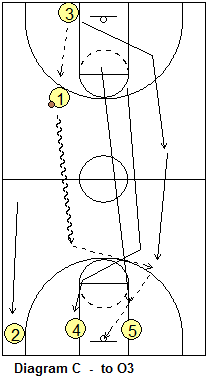 However, if O1 stops, then O4 makes a hard flash cut (our "4-cut") across the lane for the pass from O1 and the lay-up. So when doing this drill option, O4 cuts and gets the pass and lay-up. We don't want to see O4 cutting too early, nor do we want to see O1 making the pass to O4 from half-court. We want O1 to bring the ball almost to the 3-point arc, at which point O4 can make the cut. Now O1 goes to option 5, the long pass to O5 sprinting up the court to the basket. We also run plays off of the 5-on-0 drill. In this case, each team will make just two trips, a trip up and a trip back, and the point guard will call a different play each trip. This helps us not only in learning our plays, but getting us to execute them off the break. 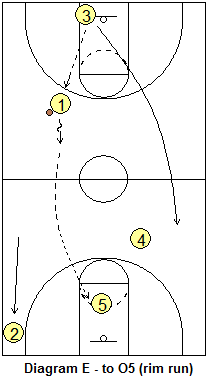 O1 will yell out the play loudly just before reaching half-court, and the other four players will yell the play name back to O1 (communication is important so that everyone knows the play).